As your age and the duration of diabetes increases, you may develop decreased sensation (Neuropathy) and decreased blood circulation (Peripheral Artery Disease) in the feet and are at an increased risk of developing foot infections, especially if you have poorly controlled diabetes. 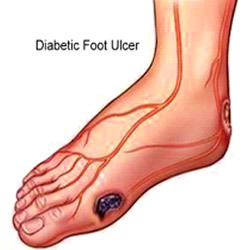 Foot ulcers and amputation are a major cause of morbidity & disability in diabetic patients, and carry an enormous physical & emotional cost. Early recognition & management of risk factors can prevent or at least delay the onset of these adverse complications by 80%. Amputation is one of the most important & avoidable long-term complications of diabetes. 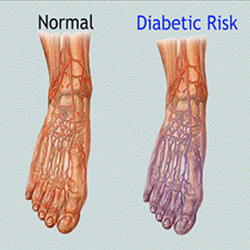 All diabetic patients are at high risk of developing foot problems esp. ulcers, infection and gangrene. Even a minor problem can have serious consequences if proper care is not taken. 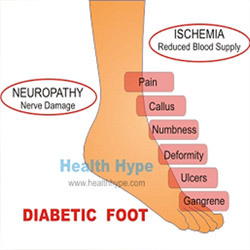 Every diabetic has come degree of foot problems like: Pain, Numbness, Cracked Feet, Calluses, Burning Feet Syndrome, Chronic Infection and Non-healing Ulcer. Q. What Causes Diabetic Foot? Decreased Sensation (Neuropathy): The neuropathic foot is warm, dry and relatively insensitive to touch. Neuropathy may affect the muscles of the foot causing clawing of the foot. The diabetic nerve damage also lessens your ability to feel pain, heat, and cold. Loss of feeling often means you may not feel a foot injury. You could have a tack or stone in your shoe and walk on it all day without knowing. You can develop ulcer with out feeling any pain and it can get infected. Infection: Both ischemic and neuropathic lesions generally get infected. Common symptoms of infection are fever, redness, swelling or pain. Pus may also be seen in the lesions. Combined Lesions: It is common for a patient to have all the processes mentioned above occurring at the same time. Thus you can have an infected, neuropathic lesion with poor blood circulation. To identify and treat the common problems of diabetic foot every individual with diabetes should know what are the abnormalities to look for in their feet. "Early Detection and Prompt Treatment can SAVE Your Feet"
Q. What are the various steps for a Better Foot Care? Wash your feet daily with lukewarm (90-95 deg F) with soapy water. Keep them clean and dry esp. between the toes. Watch for a dry, scaly or cracked skin. If your skin is very dry, use a moisturizing cream or lotion (never between the toes); if humid, use talcum powder. Inspect your feet daily, use a mirror for soles. Take the help of a family member if your vision is impaired. Exercise regularly to maintain a good blood circulation. Walking, Swimming and Cycling are good exercises for your feet. Always look for any hard skin, corns, calluses, patches of dry/shiny skin, infection, change of color, change in feelings (pain, burning, tingling or numbness),hair loss or ulcer .If present immediately consult your doctor or podiatrist. Do not walk bare foot even inside your house. Wear soft, comfortable and well fitting leather shoes. Always check your shoes before wearing for any small objects ( pebbles, pins etc.) as they may hurt your feet. Avoid high heels and shoes with pointed toes. Always buy shoes in afternoon or evening when your feet are the largest. Always get used to new shoes slowly by wearing them for 1-2 hrs at a time. Shoe inserts help in redistributing your weight on to your feet. Always consult your doctor before using them. Wear fresh, soft cotton socks on reversed side as the crease/seam may injure your toes. Always change them daily. Avoid wearing socks with tight elastic at the top. Always cut them straight & leave approx. 1 mm free nail beyond the toe. If they are thick and curved, take professional help. Have your feet checked on every visit to your doctor. Avoid extremes of temperatures esp. when you wash your feet .You may injure your feet esp. if you have loss of sensation. Be careful when you use hot water bottle, heating pads, electric blankets etc. Never use leucoplast, instead always apply a bandage. Raise the injured foot for 15-20 mins at least 3-4 times a day. Do not use strong astringent lotion (esp. iodine or boric acid). Use only mild antiseptics for cuts and wounds. You can use betadine if you are not allergic to it. No bathroom surgery please i.e. don't cut corns or calluses, always consult your podiatrist. Do not cross your legs while sitting for a long time, instead keep your feet up to improve blood circulation. Also you can do some light exercise every half an hour. Never ignore symptoms of claudication (Pain & weakness on walking which gets relieved with rest), get your vascular assessment done and take adequate treatment. Always have a good control on your Blood Glucose, BP & Lipids. "LOOK AFTER YOUR FEET AS YOU WOULD LOOK AFTER YOUR FACE"
Q. How to self- examine your feet? Hold a big size mirror beneath your feet 6-2 inches away. Look for any cracks, peeling of the skin, abnormally dry or shiny skin, colour change or any wound. Inform your doctor if any of the above is present! Q. What are the various foot/skin problems in diabetic patients? Skin Changes: The skin becomes very dry, may peel and crack. After bathing, dry your feet and apply a thin coat of plain petroleum jelly or an unscented hand cream. Do not put oils or creams between your toes. The extra moisture can lead to infection. Also, don't soak your feet — that can dry your skin. Calluses: Calluses occur more often on the feet of diabetic patients. This is because there are high-pressure areas under the foot. Calluses, if not trimmed, get very thick, break down, and turn into ulcers (open sores). Never try to cut calluses or corns yourself - this can lead to ulcers and infection. Let your podiatrist cut your calluses. Too much callus may mean that you will need therapeutic shoes and inserts. Using a pumice stone every day will help keep calluses under control. It is best to use the pumice stone on wet skin. Put on lotion right after you use the pumice stone. You can use therapeutic shoes and inserts to avoid callus formation. Foot Ulcers: Ulcers occur most often on the ball of the foot or on the bottom of the big toe. Ulcers on the sides of the foot are usually due to poorly fitting shoes. Remember, even though some ulcers do not hurt, every ulcer should be seen by your doctor right away. Neglecting ulcers can result in infections, which in turn can lead to gangrene and amputation. Your doctor may put a special shoe, brace, or cast on your foot to protect it. If your ulcer is not healing and your circulation is poor, your health care provider may need to refer you to a vascular surgeon. Good diabetes control is important. Amputation: Diabetics have more chances of foot or leg amputated than normal people. This is generally due to Peripheral Artery Disease and Neuropathy which make you prone to ulcers and infections that may lead to amputation. Most amputations are preventable with regular care and proper footwear. For these reasons, take good care of your feet and see your doctor right away about foot problems.